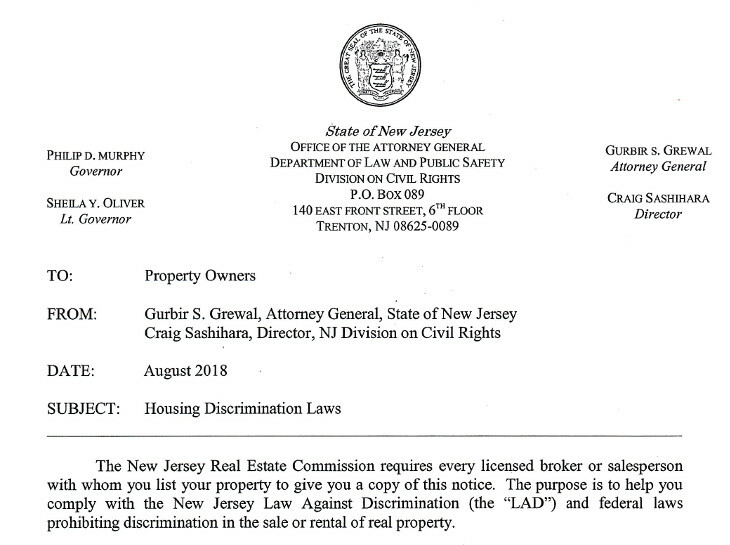 TRENTON NJ – The New Jersey Real Estate Commission requires all brokers and salespersons to give a notice about the state’s housing discrimination laws to property owners who agree to have a licensee represent sale or rental listings of their holdings. Copies of the notice were distributed for licensees’ use in August 2018 by the state Office of the Attorney General. An image of a portion of the notice appears below. Clicking on the image will open an Adobe Acrobat copy of the notice in your web browser, which can be downloaded to your computer and printed for compliance with the law.